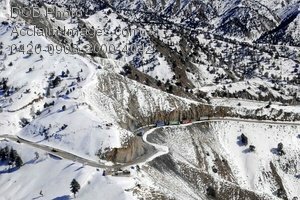 Description: Free, public domain image: Semi-Trucks Driving on Snowy Mountain Road - K-G Pass, Afghanistan. Semi-trucks hauling goods to eastern Afghanistan travel along the narrow and dangerous “K-G Pass” that works its way through steep mountains and connects the Khowst and Paktia provinces. A $100 million, 100-kilometer improved road, funded by the USAID, is slated to start construction through the pass this summer. DoD photo by Fred W. Baker II.